After she receives a minor concussion from playing soccer, Bayley discovers she had a disease called alopecia which causes her to lose her hair. As Bayley struggles to deal with the reality of her baldness she finds herself having to make some tough decisions. Can she still play soccer? Does she even want to? More importantly, should she tell Matt? And will he still want her when she does? Becoming Bayley is the story of one girl's journey through self-discovery, of the definition of true love, and of the realization that as a daughter of God, she is of infinite worth. I was laying in bed the other night and I decided I wanted to start a new book before bed. I grabbed my kindle and I knew exactly what I was in the mood for. I'd had Becoming Bayley on my wish list for a few days and couldn't stop thinking about it. So, I purchased it and I'd only gotten 2% into the book and I knew I was going to stay up all night to finish it. I knew I was going to love it and I knew it was going to be an un-put-down-able book. I didn't know how this story would affect me. I love the style Becoming Bayley is written in. It feels so natural. Nothing is forced or cheesy. It's just...real. The dialogue feels like conversations I've had. Or ones I wish I'd had. I actually got giddy when Matt and Bayley met on South Field the last night of soccer camp. It was perfect. I had to re-read the scene twice before I could move on. Bayley writes Matt on his mission but while he is away she has several trials of her own. She has alopecia. A condition that makes her lose her hair. While I was reading her struggle I felt like I was actually living it. Or that I was her mother at least. "When you hurt, I hurt." I found myself bawling into my pillow at 2am because of all I was feeling for her. Her sister and mother both perform an act of love for Bayley that still has me tearing up. I was feeling all my emotions during her struggle and my heart broke for her. I love the way author Susan Auten literally shows us how Christ can heal our wounds however big or small. What a powerful message. Bayley stops writing Matt on his mission when she feels that she can't tell him about her hair loss. The love story from there actually look my breath away. When I finished the book I wouldn't actually put the book down. I was afraid of losing some of its magic. I sat with the book in my hands and flipped to my favorite parts just to capture a little bit more before I had to close it. There were times I laughed and cried and moments that took my breath away. I'm not sorry I didn't get to sleep until 4am. I felt like I was allowed a glimpse into the trials, life and love of Bayley and Matt. This won't be the last time I read their story. I know I'll pick it up again in the future and I'll be able to feel all those wonderful feelings again. Bravo. 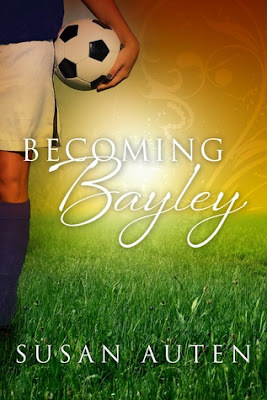 Becoming Bayley is a truly beautiful book and I loved it. Every minute of it. "Something happened during Matt's talk. When I sat down I was one person, but by the time he was done, I was someone else. Someone changed. Someone new. Someone I didn't know. My arms were covered in gooseflesh. My stomach was doing this buoyant, top-of-the-roller-coaster thing. Suddenly I wanted to be pretty. I wanted guys to think I was pretty. In particular, I wanted this guy to think I was pretty..."
This isn't my typical read, but your review has me definitely curious about this one!! Alopecia has to be scary, especially as a teenager! And the Mormon faith is always one that has me curious! I think I'm going to give this one a try - thanks (as always) for the fabulous review! I loved this book. SO good. And yes. It all felt real and wonderful. LOVED.